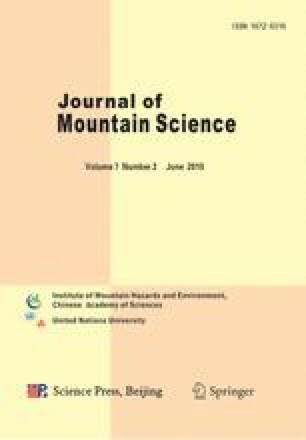 This paper analyses the diversity and spatial pattern of the altitudinal belts in the Hengduan Mountains in China. A total of 7 types of base belts and 26 types of altitudinal belts are identified in the study region. The main altitudinal belt lines, such as forest line, the upper limit of dark coniferous forest and snow line, have similar latitudinal and longitudinal spatial patterns, namely, arched quadratic curve model with latitudes and concave quadratic curve model along longitudinal direction. These patterns can be together called as “Hyperbolic-paraboloid model”, revealing the complexity and speciality of the environment and ecology in the study region. This result further validates the hypnosis of a common quadratic model for spatial pattern of mountain altitudinal belts proposed by the authors. The spatial pattern of altitudinal belts is closely related with moisture-related exposure effect in the Hengduan Mountains. Different combinations (spectra) of altitudinal belts and different base belt types appear in windward and leeward flanks and even in the same flanks of different ranges. This is closely related with the parallel mountain ranges of the Hengduan Mountains, which, at nearly right angle with the moving direction of prevailing moisture-laden air masses from west and east, hold up the warm and humid monsoon wind from moving into the core region and result in different moisture conditions in windward and leeward flanks. However, how to quantitatively describe the moisture-related exposure effect needs further study. In addition, the data quality and data accuracy at present also affect to some extent the result of quantitative modeling and should be improved with RS/GIS in the future.